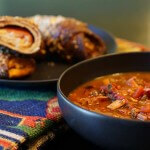 What is better on a cold winter’s day then a delicious bowl of warm & hearty soup with a great sandwich? Of course a cold winter’s day here in Fresno is when the temps dip down into the low 40’s….so let’s just pretend I’m still living in Green Bay, WI. Ok….that’s painting a better picture, right? Brrrr! If I was waking up in Wisconsin would have been to a cool 15 degrees this morning, eeek! That’s just too cold for me, I’m a wimp now – way too acclimated to our warm Cali temps! So, today I am super excited ???? ??????? ?to work with Better Bakery to bring you their Cheese & Pepperoni Pizza hand-crafted Artisan Melts! They are super yummy, creamy and cheesy!!! 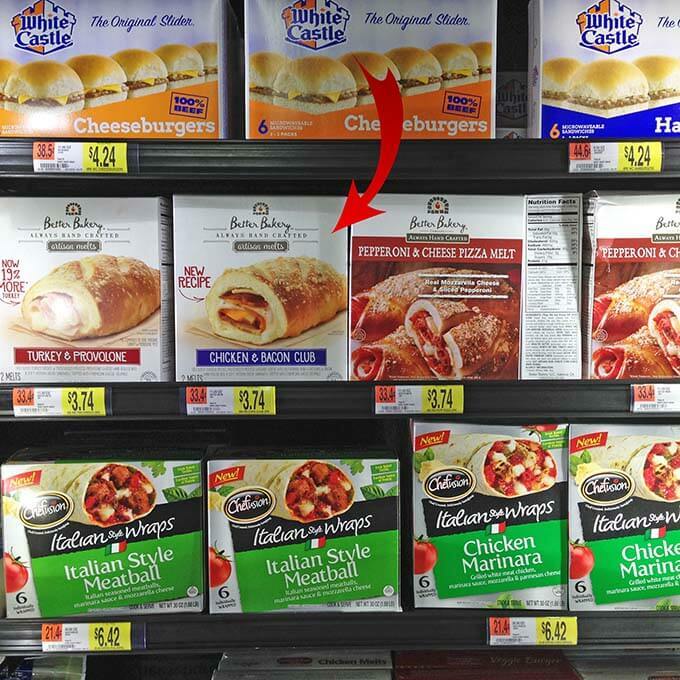 I found these at Walmart – in the frozen food section. These very yummy sandwiches are perfect with a steaming bowl of Supreme Pizza Soup! 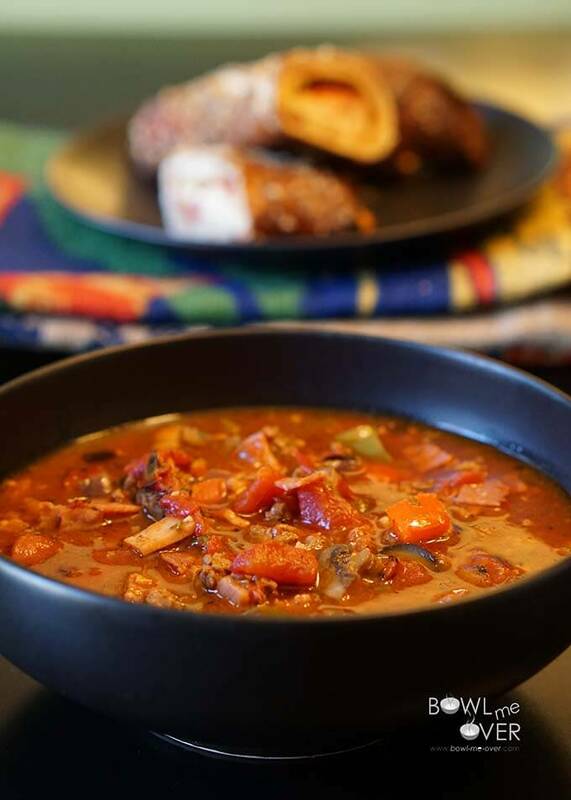 The soup has beef, sausage, Canadian bacon, pepperoni, bell peppers, onions, mushrooms, olives and tomatoes – just like a Supreme Pizza, but soup! And do you know what’s even better? In the time it took to heat up the oven & bake my Cheese & Pepperoni Artisan Melt, the soup was done! Yup, it’s true – took less than 30 minutes to put this meal together! 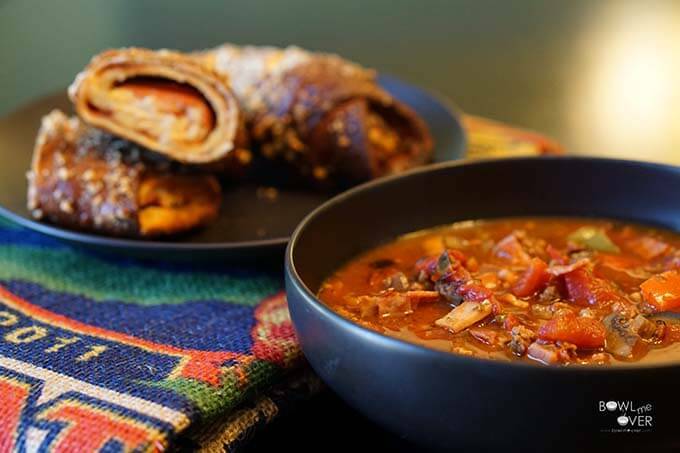 I preheated the oven and then began making this soup and before it was done baking, I had an amazing bowl of soup to dunk my sandwich in – that’s my kinda meal! Soup & Sandwich – my kinda meal! 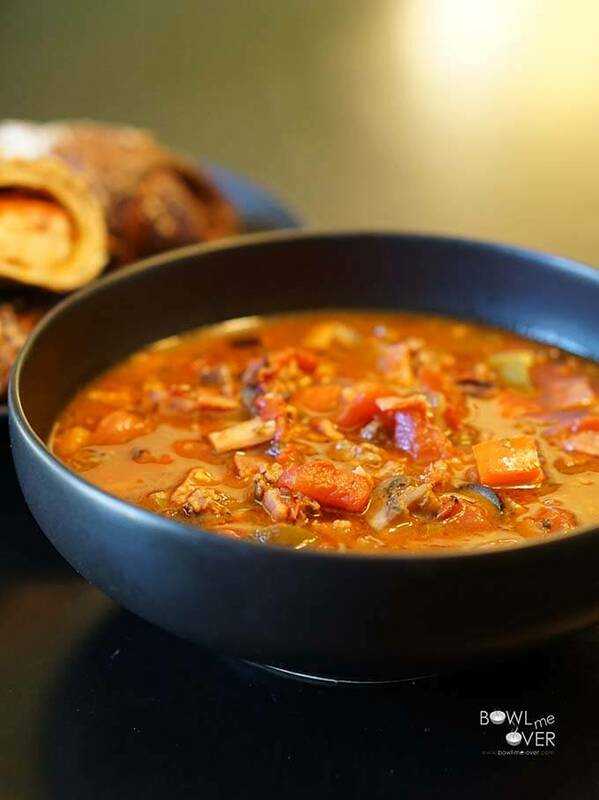 What is amazing about this soup is because we are taking some flavor shortcuts – Italian sausage, Canadian bacon, pizza sauce and pesto, it’s going to taste like a soup that has simmered on the stove all day long, but in reality takes less than 30 minutes to cook! Supreme Pizza Soup will please even the pickiest eaters in your house. It is savory & hearty, but is super easy and uses ingredients you probably already have in your pantry & fridge! So before you head down to pick up a Cheese & Pepperoni Pizza or Chicken & Bacon Club Artisan Melt. Click here to find a store near you! Supreme Pizza Soup - 30 minute soup is savory & hearty, but is super easy and uses ingredients you probably already have on hand and just like pizza a family favorite! Place a large stockpot over medium heat. Add the hamburger & Italian sausage and cook until browned, drain the fat. While the meat is browning chop the bell peppers, mushroom, onion & mince the garlic. Once you've drained the excess fat off the meat, add in the vegetables, season with black pepper & red pepper flakes. Fry for about 5 minutes just until they just begin to soften. Add the pizza sauce, fire roasted tomatoes and beef stock. Stir well being sure to scrape the bottom of the pan to remove those brown bits (that's where the flavor is!!!). Increase the heat to high and bring to a boil. As soon as it comes to a boil, reduce to low - add in the pesto, stir well to combine and simmer for 5 minutes. That's it, your soup is done! Serve & enjoy!! This soup sounds so good! I love pizza, we eat it way too often. This looks like a great alternative to shake things up a bit! That’s it exactly – I’m such a soup gal, it’s a soup we really enjoyed!! I’m looking to try something different I like eating pizza as a snack ,the soup sounds good I’m sure family and friends will like it. Wonderful, I’m glad you’re going to give this a try Allan! this looks delicious and since it’s cold here (actually snowing right now), it would be the perfect warm-up dish!! Brrrr!!!! A winter wonderland or is that snow getting old by now? 😀 Thanks for stopping by Katie, I hope you give it a try and enjoy the soup! Pizza Soup? What a wonderful idea. This is a meal my entire family would love! Yes Joanie – this is a family favorite!!! That soup would be a hit with my whole pizza loving family. I like the addition of the pesto at the end! The pesto really pumps up the flavor at the end, thanks for stopping by Kristen! 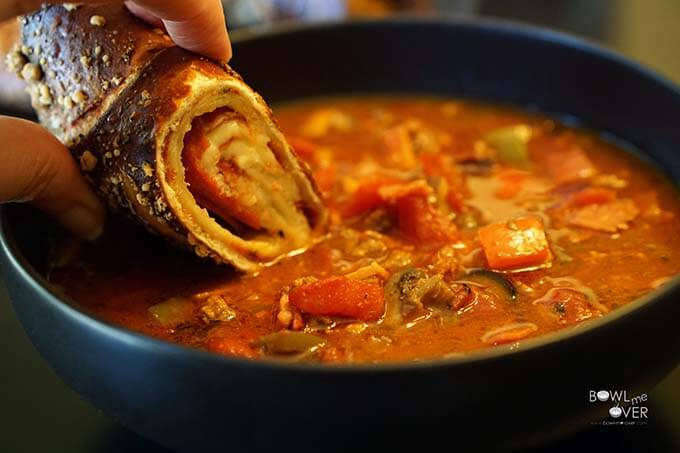 Combo Pizza Soup, what an ingenious idea! It has everything to make this a main course meal full of flavor, meat, and veggies. Perfect complete dish. 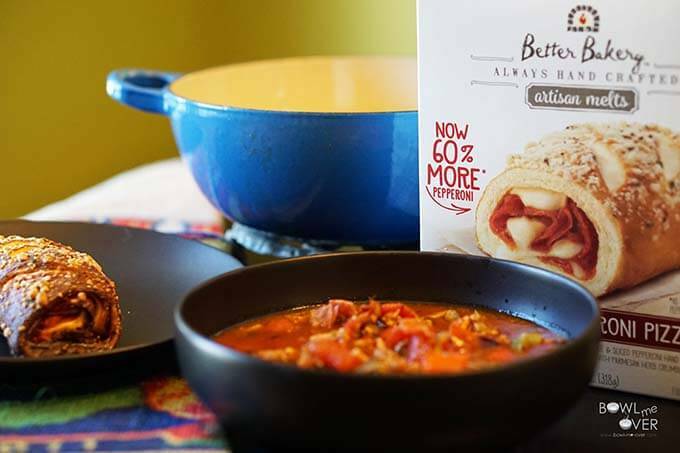 Thanks Michelle – so flavorful and super hearty! What a winning combination. Looks great. Thank you Peter – enjoy!!! Wow, what a unique idea! Who doesn’t love everything pizza! What could be better on a cold day! Melt with soup! The most delicious combination ever. Great post, Debra! This is a great twist on soup and I love that it is so quick!! OMG pizza in soup form?? How amazing and creative! My family would LOVE this, putting it on my must-make list. It goes together so well – such a great combination of flavors – thank you! Ummm, it’s -8 degrees here today, so yes, I’d love this soup & sandwich combo! Brrrrrrr.